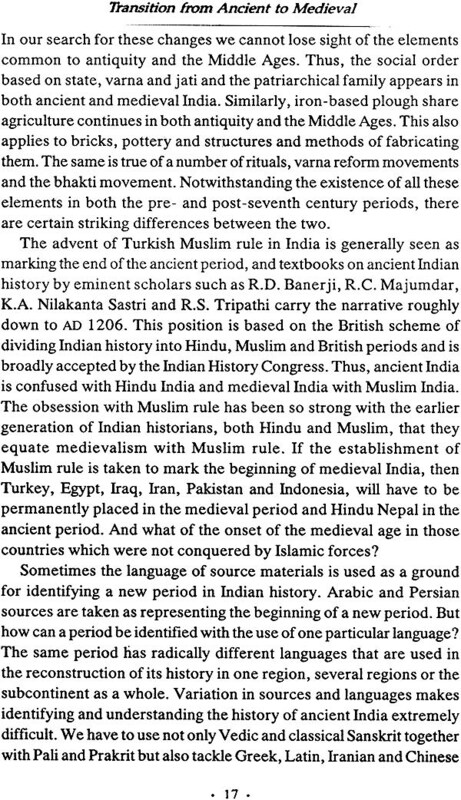 The early medieval period is the focus of R S Sharma’s analysis. 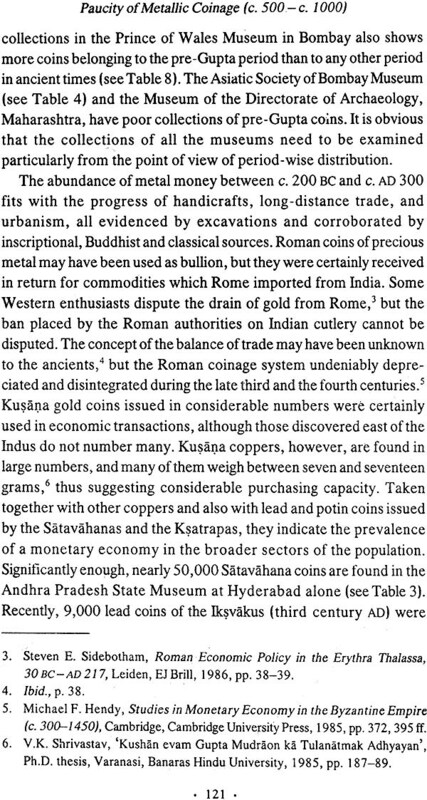 In this book Sharma highlights the feudalisation of the socio-economic structure of India in early medieval times and attributes the rise of land grants to the varna conflict and the decline of trade. His panoramic sweep takes in the situation of the peasants and he underlines their loss of control over production due to the dominance of landlords. 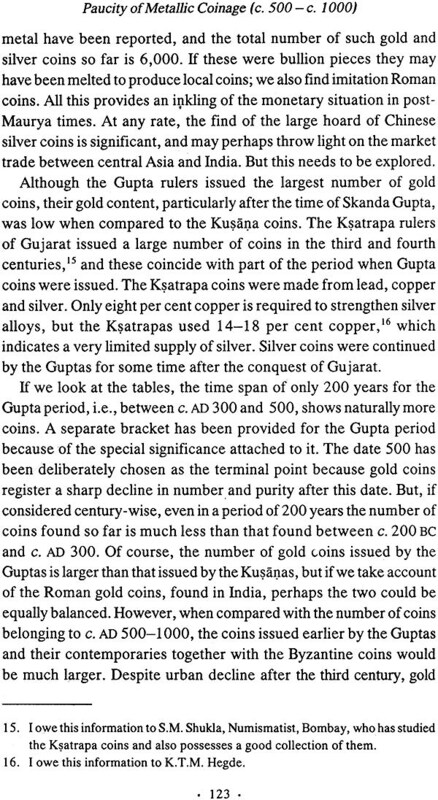 Sharma also examines the traditional varna system and reveals how it was adjusted to the landed hierarchy. 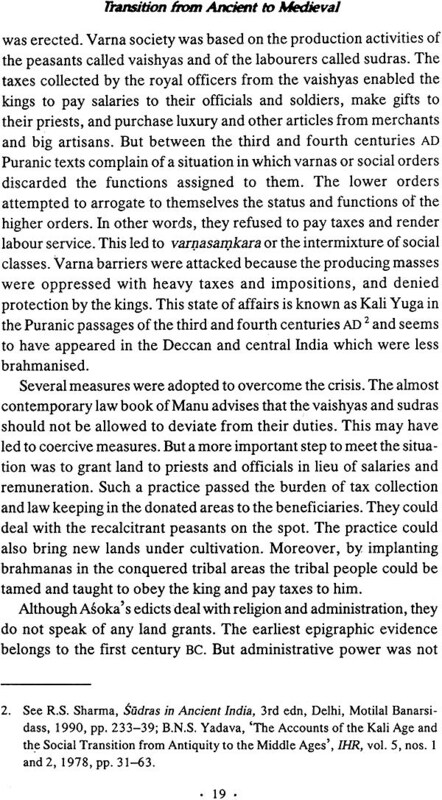 A riveting discussion of the influence of tribals on brahmanism and the proliferation of the sudra and other castes is included. Sharma argues that the presence of landed magnates altered ways of thinking in legal, social and religious matters. R S Sharma’s compelling style and breadth and depth of vision make this book accessible to professional historians and sociologists as well as to those interested in the medieval roots of many of our social and cultural ideologies and institutions. 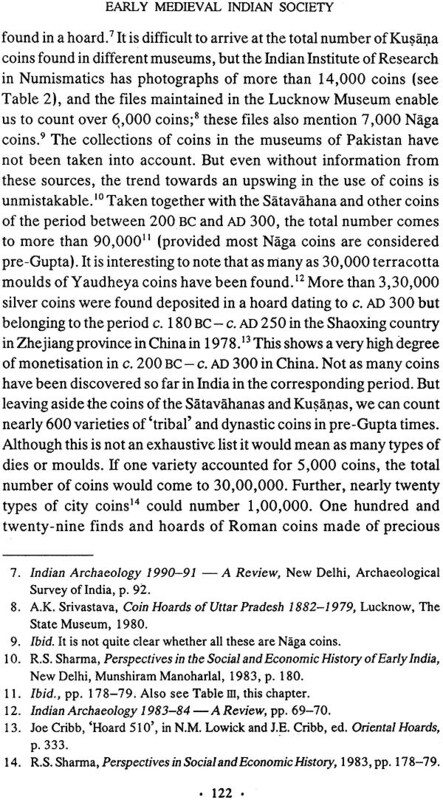 R S Sharma is Emeritus Professor of History, Patna University. Earlier he taught at Toronto and Delhi Universities. He was the Founder-Chairman of the Indian Council of Historical Research and was given the V K Rajwade award in 2002 for Life-long service and contribution to Indian history by the Indian History Congress. His well-known book, Ancient India was withdrawn by the Indian Government in 1977, restored in 1980 and withdrawn once more in 2002. 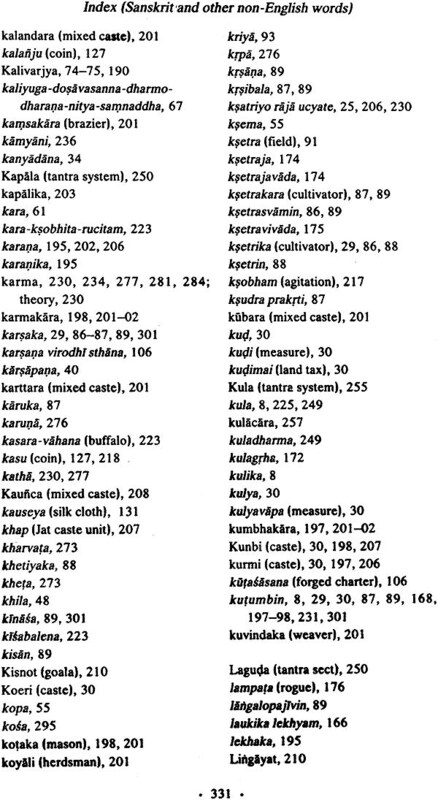 Some of his other books are Sudras in Ancient India, Aspects of Political Ideas and Institutions in Ancient India, Indian Feudalism, Material Culture and Social Formations in Ancient India, Urban Decay in India (e. 300-e. 1000) and Looking for the Aryans (published by Orient Longman). Translations of his writings appear in fifteen languages, Indian and non-Indian, and language versions of his books number more than seventy-five. The title Early Medieval Indian Society is used in its widest sense. Besides social structure, it also covers polity, economy, religion and ideology. All these are treated in the context of feudalisation. Some essays included in the present book were published earlier, and others are being printed for the first time. Though I have revised and updated all the published essays for adaptation in this book, I could not remove all the repetitions and other deficiencies, for which I crave the indulgence of the reader. 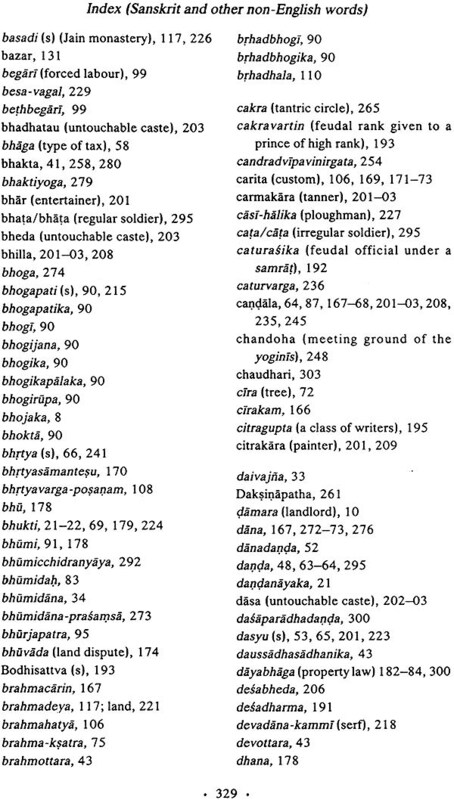 The transliteration system followed in this book excludes many Sanskrit and other Indian words included in the Oxford Advanced Learner’s Dictionary. Professor B.N.S. Yadava read the typescript and made some valuable suggestions regarding the contents. Professors P.D. Tripathi and A.K. Sinha made some improvements in the language. Professor Sita Ram Roy and Professor Angaraj Chaudhary have helped me in proofreading. 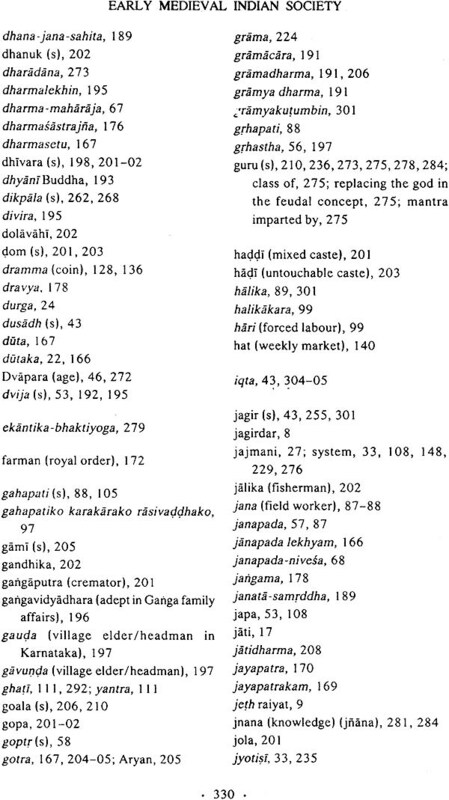 Dr Anjani Kumar prepared the Index. Gopi Raman Choudhary and P.N. Sahay gave me library assistance, and Dr Nandini Rao took great pains in preparing the final press copy. My sincere thanks to all these helpers. In writing this book I received support as a National Fellow of the Indian Council of Historical Research, New Delhi, and as a K.P. Jayswal Fellow of the K.P. Jayswal Research Institute, Patna. I express my gratitude to both these institutions. 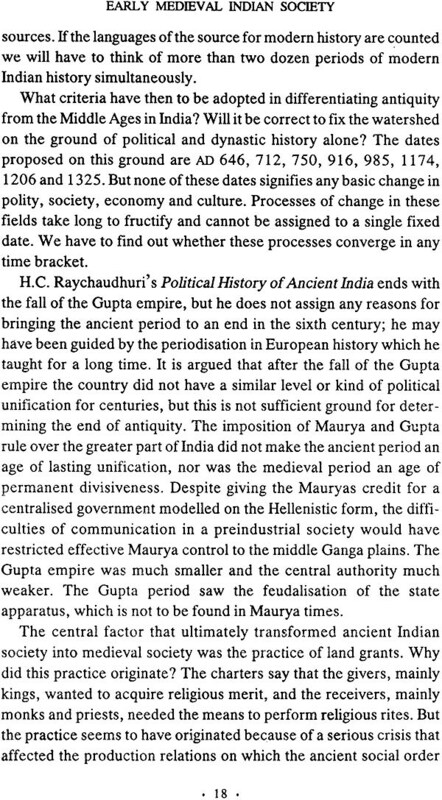 I first dealt with early medieval Indian society in my book, Indian Feudalism, which was primarily concerned with polity and economy. Reissued in 1965 as an elaboration of a paper I originally published in 1958, it generated considerable debate among Marxist and other scholars about the nature of early medieval social formation. They raised questions of both fact and judgment. 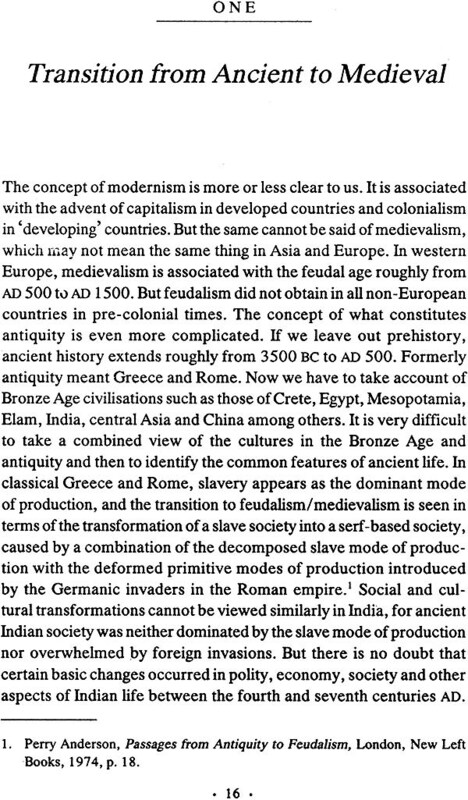 In the present book I have tried to clarify the concept of feudalism and extend my discussion of polity and economy. I have also included material on the social and cultural aspects of the early medieval period. In my understanding of feudalism I give the greatest weight to the economic factor. Gross disparity between various classes of people in their control over land and their appropriation of its product is the motive force behind social transformation. Since land is the chief means of production in preindustrial societies, unequal access to its use and its surplus product gives rise to a rent collecting landocracy and a subject peasantry. The dominant class of landlords and the servile peasantry, therefore, are essential elements in the structure of feudalism presented in Marxist writings. In his Feudal Society, Marc Bloch expounds a similar concept. Marx did not examine the social and political aspects of feudalism. He looked upon it as a mode of production from which arose the capitalist mode of production. His views on the feudal mode of production may be summed up on the basis of John Pryor. According to Marx, craft and agricultural production in the feudal mode, was carried on by a non-free labour force on large estates, which were ‘owned’ or effectively possessed by non-labouring landlords. In this mode the ‘transfer of surplus labour or product of labour was effected not by economic means as in capitalism but rather by the exercise of direct political, legal and military force or coercion necessitated by the effective property rights of the producing labour force’. Marx accounts for the origin of the feudal mode of production in Europe. He was the first to perceive and underline the mingling of the Roman and German modes of production. He stated that for the Germanic barbarians who lived on the land, ‘agriculture with bondsmen was the traditional production’, while in the Roman provinces ‘the concentration of landed property which had taken place there had already entirely overthrown earlier agricultural relations".’ It was easy, therefore, for the Germanic barbarians to impose their conditions on the Romans. According to Marx, the mingling of the two elements gave rise to the feudal mode of production. In this mode, i.e., Romano-German feudalism, land could not be alienated to the commoners. 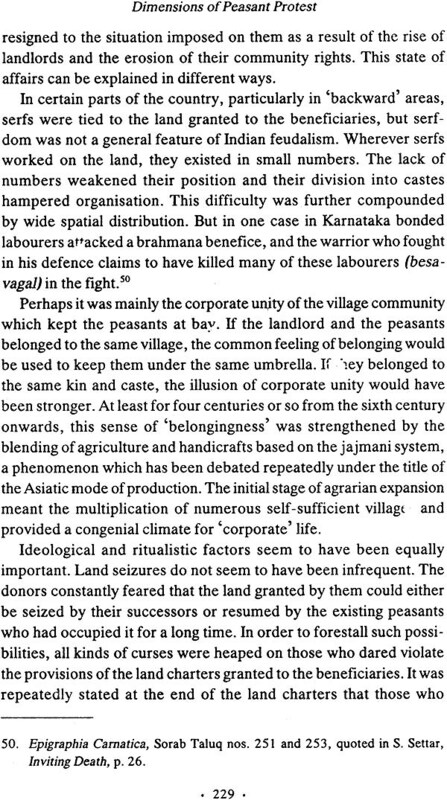 In my view, in many preindustrial countries concentration of land in the hands of a few landlords, who got the land cultivated with the help of dependant rent-paying agriculturists, was the essence of the feudal mode of production. The political superstructure that grew out of this system is often noted by scholars who ignore the mode of production on which it was based. In the Indian context, the ideas of Marx on feudalism appear in his criticism of the nineteenth century Russian scholar Kovalevsky’s application of the feudal model to the sultanate and the Mughal rule. Kovalevsky draws attention to the prevalence of the benefice system. But Marx does not consider it an essential trait of feudalism. He regards serfdom as an essential feature of feudalism, though Engels does not hold this view. In my view, underlying the feudal structure is the subjection of the peasantry by the landed intermediaries. This matter on the whole deserves far more attention than any particular method by which the intermediaries ensured subjection. Serfdom was designed to organise agricultural and craft production on the estate or manor of the lord. The peasants were forcibly attached to the large land holdings and given small pieces of land for their support. The practice was meant to keep them under control and to ensure that land was not held in any large measure by the commoners. But serfdom cannot be regarded as the sole method of mobilising peasants for carrying on production; it was not the only way of exploiting the labour of the peasants. The peasants could be made to render services and payments through other methods as well. Both Marc Bloch and the Marxist Russian historian E.A. Kosminsky, regard the servility of the peasantry to be the crucial element of feudalism but they do not assign the same importance to serfdom. Institutionally the Western feudal system is identified by benefice including the military fief, commendation, vassalage, immunity from the operation of police and judicial authority of the state, subinfeudation and serfdom. 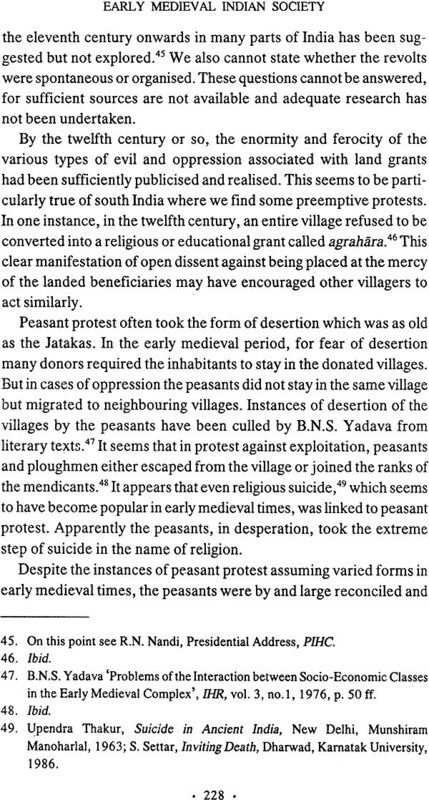 These institutions resulted in the servility of the peasantry, but even without some of them we notice the subjection of the peasants to the landocracy. Neo-Marxist scholars do not regard the fief or land grant meant for military service as the cornerstone of feudalism. They do not consider it even the most important element. They argue that a feudal mode of production prevailed in Europe in the Middle Ages and would have continued throughout this period even if the military fief had never existed. In their view ‘the fief could never have existed without a pre-existing socio-economic structure of estate production’. 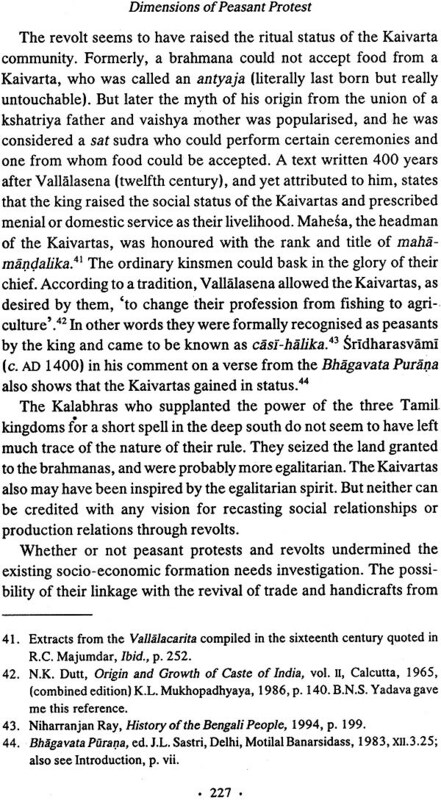 Many institutions that developed in early medieval India to keep the peasants under control and make them pay, recall the European types. These include religious, administrative and military fiefs, vassalage, freedom of the beneficiaries from the operation of the police and judicial authority of the state and the practice of subinfeudation. Institutions peculiar to India include hierarchy in the religious system and the well-organised caste hierarchy. 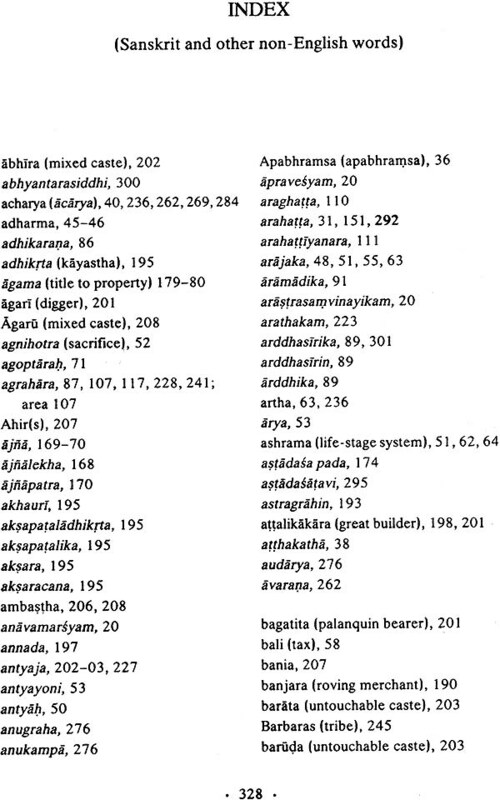 These are linked to feudal property relations in land, and effectively support and perpetuate those relations. The causes of the origin of feudalism should not be confused with the traits of its structure. The ways in which the nature of property relations in land were altered may differ from area to area. 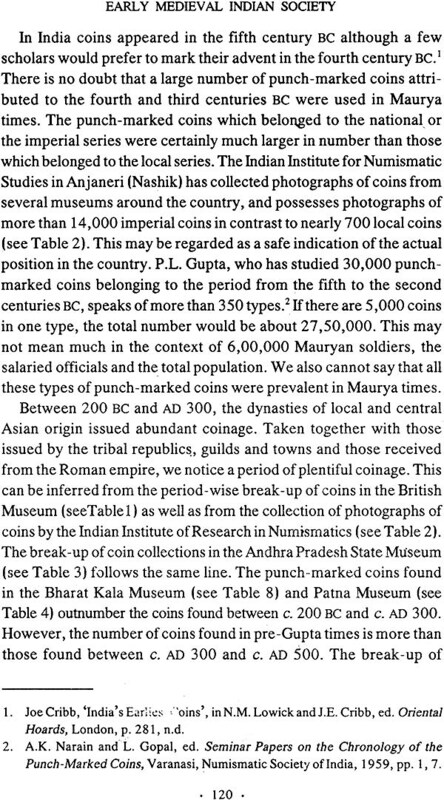 In Europe the Hun invasions in the fourth and fifth centuries played a vital part in this process, but in India, internal convulsions seem to have been the main reason behind the widespread practice of land grants. Grants gave rise to landlords, and also to feudatories who owed their origin to war, diplomacy and other factors. However, all the feudatories had to perform the same set of obligations in the feudal set-up. The Allahabad Inscription of Samudra Gupta tells of five feudatory kingdoms and nine feudatory tribal states under that great conqueror. All these feudatories were obliged to pay tribute, obey orders, attend court for personal obeisance, and offer their daughters in marriage. Whether the feudatory headed a varna - based community or a broadly egalitarian tribal group, he paid the overlord out of his collection from the peasants who were burdened with supporting both the immediate lord and the distant overlord. 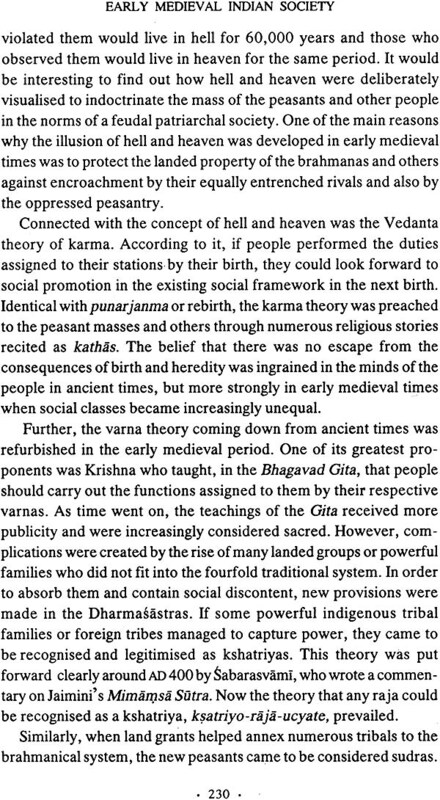 Therefore, once the feudal system was established, its economic traits were more or less the same in India and other countries. Whether a lord was a tribute- paying feudatory, or a landlord created through a royal charter or one developed out of a tribal chief or royal agent, his relation with the peasants was one of collector of rent and labour service. It also did not make much difference whether the lord was hereditary or not and whether he belonged to the caste or kin group of his peasants.